If you aren't sure what a head unit even is, it's basically just a more precise way of referring to the component you probably know as a car radio or a car stereo. The head unit sits at the core of your car audio system, so it’s easy to see why this component is such a popular candidate for upgrading. Not only does the head unit dictate the functionality and, to a degree, the performance of your car audio system, it’s also the single most visible component. When someone sits down in your car or truck, your head unit is one of the first things they see, and that’s a major, driving force behind cosmetic and aesthetic upgrades. On the other hand, your head unit also serves as the interface for your sound system, so usability is also an important factor. The sheer number of aftermarket head units on the market is staggering, and a whole new crop is released every year, so it’s easy to suffer from choice paralysis. In order to help you identify the right head unit, there are a number of questions that you’ll want to figure out the answers to. What head units will actually fit in your car? Is budget or quality more important? What are your overall plans for your car stereo system? How do you use your head unit now? How would you like to use your head unit? By the time you’ve answered those five, vital questions, and learned about all the available features and options, you’ll find that shopping for a head unit can be both easy and fun. If you have a double DIN car stereo, you can replace it with either a single or double din head unit. Before anything else, you need to ask the question, “What stereo will fit in my car?” If you’re able to answer that question, the field of potential head unit choices will fall away and leave you with nothing but car stereos that will actually work in your vehicle. Single DIN car stereos, which are roughly two inches tall. If your car has a single DIN head unit, then you can probably only replace it with another single DIN car stereo. There are a handful of exceptions where a factory single DIN head unit is installed in a dash that can accommodate a double DIN stereo, but you shouldn’t count on that being the case. If it looks like your dash might be able to take a double DIN unit, then you may want to disassemble it to see if it really will. Double DIN car stereos, which are about four inches tall. If your car has a double DIN head unit, then you have more options. You can choose to replace it with an aftermarket double DIN stereo, or you can use a bracket kit to install a single din unit. If you replace a double DIN car stereo with a single DIN head unit, you may be able to add an additional component, like a graphic equalizer, or a storage compartment. Most car stereos are either single or double DIN, but there are other form factors out there. The most common non-standard radio size you'll run into is 1.5 DIN, which is exactly what it sounds like. You can replace this type of head unit with a single DIN or a direct-fit unit. The other thing you might run into is a totally non-standard head unit that defies definition. You can still upgrade a non-standard head unit, but it may be more trouble than it's worth. If you scrimp on price, you might have to forgo useful functionality like a front-facing USB port. Everyone has different priorities, and it’s perfectly viable to build a car audio system for either budget or quality. There are a lot of good head units out there that won’t break the bank, but you will have to loosen the purse strings a little if you really want to take things to the next level. With that in mind, it’s absolutely imperative to ask yourself, “Is quality more important, or is price the deciding factor?” before you start shopping for a head unit. Sound quality, which often takes a hit in budget-priced head units. This is particularly true in terms of power since lower-priced head units typically lack a high-quality built-in amplifier. If you’re working on a budget, and you want to able to beef up your sound quality later on, then make sure to choose a budget model that includes preamp outputs. That will allow you to add in an amplifier, equalizer, and digital sound processor in the future. Ease of use can also suffer in budget-priced car stereos. If you’re shopping for a head unit with a tight budget, then you’ll want to actually go to a store that has floor models so you can play around with the controls. Make sure to stand a few feet away from each head unit to see whether you can easily read the display, and really dig into the menus and options to make sure that the unit won’t be too hard to use when you’re driving. If you’re going with a single DIN head unit, then you might also want to look for a stereo that has a two-line display. These head units may be priced out of your budget, but they’re typically easier to read when you glance down at them. Aesthetics and cosmetic factors also come into play when you’re shopping on a budget. More expensive head units typically look better, and you usually have to shell out some extra money for the type of flashy bells and whistles that really make a head unit stand out. What kind of head unit do you have now? This might be the most useful question you can possibly ask yourself because it allows you to identify what you like about your car stereo and what you’d like to change. Think about the features your head unit has—AM/FM radio, CD player, tape player, auxiliary inputs, CD titling—and whether you use them or not. If there are any features that you particularly like, then you’ll want to shop for a new car stereo that has them. What kind of head unit do you want to replace it with? After you’ve thought about your current car stereo, you can start thinking about additional features that you’d like to have. If your head unit doesn’t have a CD player, but you’d like to be able to burn discs and take them on the road, then you’ll want to shop for a CD receiver that can handle CD-RW discs and multiple audio codecs. Is the rest of the system still factory stock? If you’re just replacing your head unit, then you have to work around other components that are probably mediocre at best. You’ll have to take that into account when shopping for a head unit since even the most expensive car stereo won’t be able to make up for anemic speakers or the lack of an external amplifier. Are you planning on upgrading anything else? If you have great plans for your car stereo, then you’ll want to take those into account when shopping for a new head unit. Don’t buy a head unit for the car sound system you have now: Buy a head unit for the sound system you want to have. If you plan on adding component speakers and a great amp down the line, then get a head unit that includes both a built-in amp and preamp outputs. How Do You Use Your Head Unit? If you want to listen to your iPod on the road, then make sure to find a new head unit that's up to the task. After you’ve thought a little bit about what will fit in your car, what your budget is, and figured out where you’re going with this whole upgrade thing, it’s time to really dig into the types of features that your new head unit needs to have. Consider how you use your head unit — do you listen to the radio a lot? Would you rather plug in your iPod or queue up your favorite custom Pandora Internet radio station? HD radio is an incremental upgrade over conventional AM/FM radio, but it may be worth having in your new head unit. If you like to listen to the radio, and you live in an area that has good HD radio coverage, then this is definitely a feature you should look for. If you’re not sure whether HD radio is available in your area, then you can check iBiquity’s list of HD radio stations to find out. Internet radio is another great option, and it’s especially useful if you love the radio but don’t have any good stations in your area. This option does require an Internet connection, so it won’t do you much good if you don’t have some type of mobile hotspot. It’s also worth mentioning that you can use your smartphone or tablet to stream Internet radio to some head units via Bluetooth. Satellite radio is also a viable alternative to traditional radio, but it does require a monthly subscription fee. This is a good option if you’re in your car a lot and you regularly find yourself in areas that have spotty radio coverage. With satellite radio, you can drive from one side of the country to another without changing the station. CDs are still a great way to listen to music on the road, so this is an option that anyone who has a large CD collection should look for. Most head units include a CD player, although there are a number of mechless options as well. If you like to burn your own CDs, then you should also look for a head unit that supports the CD-RW format. In that case, it’s also important to make sure that the head unit can handle files like WMA, MP3 and AAC. MP3 players are an even better way to bring your digital music collection on the road. If you have an MP3 player (and if you have a modern smartphone or tablet, you have an MP3 player) then you should look for a head unit that has a front-facing auxiliary input. Some head units also have rear-mounted auxiliary inputs, but those aren’t as easy to use with a component like an MP3 player that you’ll want to unplug and take with you. On the other hand, Bluetooth functionality can also allow you to stream MP3s and other digital music files from your smartphone. iPods are just Apple’s answer to MP3 players, so they will work with any head unit that supports generic music players. However, some head units have built-in iPod controls. If you want to be able to control your iPod from your head unit, then you’ll want to zero in on car stereos that have that functionality. You don't need to drive a Tesla Model S to take advantage of features like a USB input, but it sure helps. Bluetooth is fast becoming a ubiquitous, must-have feature. If you want to be able to interface your head unit with a smartphone, tablet, hands-free calling device, or other useful technology, then you need to have Bluetooth. App control is a cutting-edge feature that allows your head unit to take control of your smartphone via Bluetooth. One example is Pandora Internet radio app control, which allows you to access the Pandora app on your phone without actually looking at your phone. GPS navigation might not be a must-have, but it is an incredibly convenient feature. Standalone units are fine, but they just add additional clutter that you don’t really need. If budget isn’t a huge concern, you might want to look at head units that include a built-in, touchscreen GPS navigation option. DVD or Blu-ray playback is another optional feature that can really come in handy. Video head units include this by default, but non-video head units sometimes have the option as well. In that case, you can use your head unit to power external displays that are mounted elsewhere in your vehicle. Internal storage is essential in mechless head units, and it allows you to turn your car stereo into a digital jukebox. Expandability via a USB jack or SD card slot is another way you can listen to digital music on your head unit. This is a feature that a lot of OEM infotainment systems are starting to key into, but you can also take advantage of it with some aftermarket units. What’s Next in Buying a Head Unit? After you’ve answered the five vital questions about your head unit and car stereo, you should have a pretty good idea of what to look for when you start shopping. 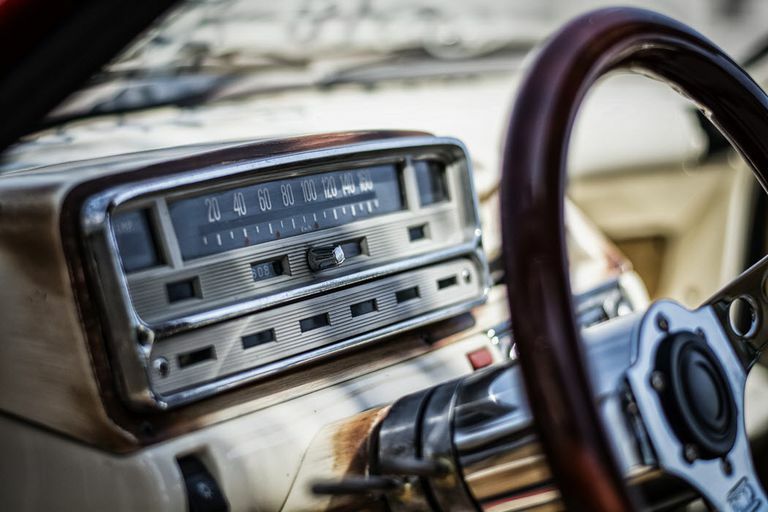 If you want to dig in deeper, you can check out some resources that explain other car stereo components and go over your head unit, amplifier, and speaker options.